I had one lonely Meyer Lemon left, when I bought the Meyer Lemons over the weekend. Even if you don't have any Meyer Lemons, you can use a regular lemon. I have known Carolyn for many years and we have shared this bread over countless cups of coffee and tea, at tea parties or coffee klatches. Actually, there is only lemon zest in the bread batter, but there is a lemon glaze that is poured over the warm bread, as it comes out of the oven. 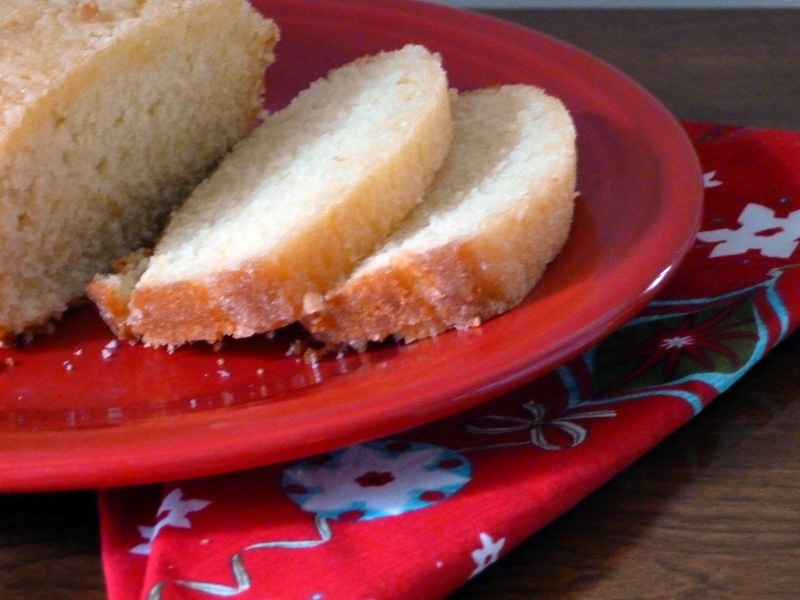 The bread is moist with a delicate lemon flavor, topped with the sweet, lemony glaze on top. Carolyn always has a loaf of this bread in her freezer, because it freezes well, for unexpected guests. This bread would be perfect for the upcoming holidays, for a quick breakfast, snack, or on your dessert tray. Enjoy! Cream butter with sugar, till light and fluffy. Add 2 eggs and lemon zest. Beat well. Whisk flour and baking powder together in a separate bowl. Alternately, add the flour mixture and 1/2 c milk, ending with dry ingredients, to creamed sugar and eggs. Pour batter into an 8x4 pan sprayed with cooking spray and dusted with flour. Bake at 350 degree oven, until pick inserted in middle comes out clean. After removing the loaf from the oven, pour glaze over the bread with sugar dissolved in the juice of the lemon. Cool on rack. **I used a glass pan, so I baked in 325 F oven for about 1 hr. 10 min. I need to get my hands on some meyer lemons. Those slices of bread look fantastic. I'd have to hide any frozen loaves of this. It wouldn't last; even in the freezer! Lizzy- The Meyer lemon roll is over for now. I'm out of Meyer Lemons. On to Christmas Cookies! I have five measly Meyer lemons on my tree this year. I was going to make a dessert with them, but I might have enough left for this bread. I can buy them here, but I think it will be a couple of weeks before they are in the market. Hoping you are off to a great start this week. Gina- I don't know where my Meyer lemons came from, only thing on the Sunkist bag was USA. This is a great recipe for 1 lonely Meyer Lemon Scott's surgery if Friday, so I have lots to do before then. I absolutely love lemon bread! It's so refreshing and goes so well with my favorite hot beverages! They say every picture tells a story and the story on this bread is that it is moist, light and oh so citrusy! Irresistably delicious-I definitely have a craving now! Steph- This lemon bread goes with any beverage, and it's so good. Tina- Thank you for your sweet words. Good to see you back from your vacation!